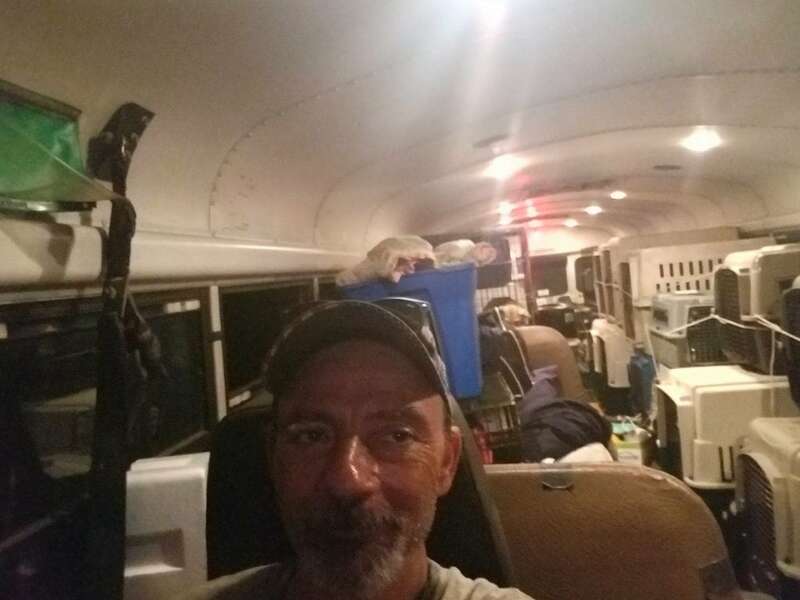 Alsup, a 51-year-old trucker from Greenback, Tenn., has been rolling in the bus quite a bit recently; he headed to the Carolinas last week to rescue as many animals as he could ahead of Hurricane Florence. The total? 53 dogs and 11 cats claimed from South Carolina shelters in the path of the storm, the Greenville News reported. Unsurprisingly, Alsup would love to open his own shelter one day, but for now, he’s happy to rescue shelter pets from the floodwaters (or anywhere else they need his help). It began when he saw the situation in Texas following Hurricane Harvey — the overcrowded shelters. He thought he could help, but had no vehicle that could do the job of transporting so many. He has since helped with rescues during several hurricanes. This time around the bus was stacked with kennels and loaded up with supplies — food, water bowls, leashes, toys and more. He kept his many Facecbook followers informed, letting them know there is always a need for more, asking where else he might be needed. After stops at the Humane Society of North Myrtle Beach (S.C.), the Dillon County (S.C.) Animal Shelter, the Saint Frances Animal Center in Georgetown, S.C., and more, he had rescued all the “leftover” pets — the dogs and cats for which the shelters couldn’t find places. Once loaded up, Alsup headed to Foley, Ala., where his friend, Angela Eib-Maddux, opened her privately run dog shelter for the night. She gave them baths and fluffy blankets and “spa treatment,” Alsup said, until they could find enough shelters or foster homes for the animals. Some animals were adopted straight away, 40 others, via coordination between Alsup and additional shelters and volunteers, went to Knoxville, Tenn. From there, those left went to scattered shelters with vacancies. At the time of the interview, Alsup’s next stop (if he could make it; he had heard roads were closed) was Wilmington, N.C. He heard there was a shelter that needed him.